Of course, nothing beats a professional interior detailing. But that doesn’t mean that DIY cleaning shouldn’t be done in between appointments. 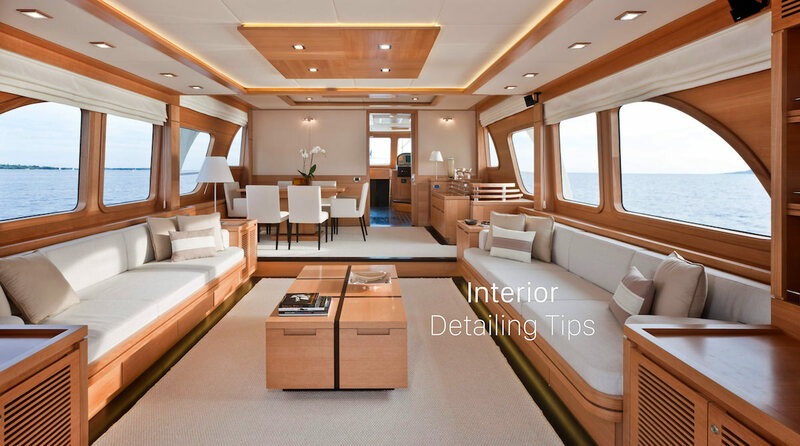 In fact, it will make your professional detailing appointments cheaper and your overall enjoyment of boating much greater. You don’t have to do all one hundred and one suggested cleaning chores after every outing, but you do have to be conscious about how you treat your boat before, during, and after each trip. Proper boat maintenance is all about consistency, and if you do a few little things religiously, you won’t have to spend a whole day turning your boat inside and out to get the clean results you want. For example, a good long rinse with freshwater will keep your boat rust-free longer than if you simply stow it away in the boathouse after each trip. Washing your boat with freshwater gets rid of the salt and other mineral deposits, sand, sediment, and trash that may have accumulated on your boat during the trip. Winterize your boat properly before putting it into storage. Whether you have an inboard or an outboard engine, you have to make sure that your boat stays in good working condition throughout the long winter months. Get rid of all the water that may have accumulated in the nooks and crannies of your boat. Moisture can eat away at the paint or encourage corrosion. Select the right cleaning solution. Recently, more and more boat owners have become conscious of how they can contribute to environmental conservation efforts by picking out eco-friendly cleaning products. So whether you’re a boat owner, a car owner, or both, you should select a quality cleaning product that will deliver great results as well as protect the environment. Keep a variety of cleaning tools handy. Brushes with different stiffness and lengths, a couple of microfibre wash mittens, chamois cloths, and a sturdy hose with spray nozzle are worthwhile investments to keep your boat looking clean and reducing wear. Make sure that you have enough of them on board so that you will have no problem doing spot cleaning if the occasion calls for it. Wherever you may be on the boat, water and moisture can get trapped, even in the foam cushion of your seats. Spray on a generous amount of vinyl cleaner to prevent rot and keep your upholstery moisture-free. You can also use a conditioner or protectant to help repel stains and keep your upholstery looking like newer, longer. Varnish wooden ornaments on your boat. Teak is a common material found on boats, but boat owners sometimes forget to clean and polish it regularly to maintain that deep, healthy glow. Teak oil to really bring out the natural gloss in the wood while keeping it from cracking or fading.